Advertising fraud is a complex challenge, but one that we are working to simplify for our partners. That’s why we’ve developed sophisticated systems, including over 180 automated filters and detection algorithms, to prevent invalid traffic from impacting our clients. For years, we’ve used these technologies to protect Google-owned media properties from invalid traffic and now we’re working to expand them to help the rest of the ecosystem. Today we’d like to highlight three areas we are investing in for DoubleClick Bid Manager, to help our partners build trust in the advertising supply chain. In the coming months, we’ll be implementing new infrastructure to further automate the refund process for invalid traffic. Supply partners like AppNexus, Index Exchange, OpenX, Pubmatic, SpotX, Teads, Telaria and DoubleClick Ad Exchange have been very supportive of these changes and have committed to provide advertisers with refunds for invalid traffic detected up to 30-days after monthly billing. These commitments, along with others, cover over 90% of the available inventory in DoubleClick Bid Manager. Soon, we’ll identify in Display & Video 360 which supply partners provide refunds for invalid traffic and offer advertisers the option to buy only from those sources. This will make it easier for our customers to collect refunds for invalid activity. It’s hard to prevent invalid activity if you don’t know how you’re being impacted. That’s why we’re investing in reporting features to give advertisers and supply partners greater visibility into what our invalid traffic defenses detect. 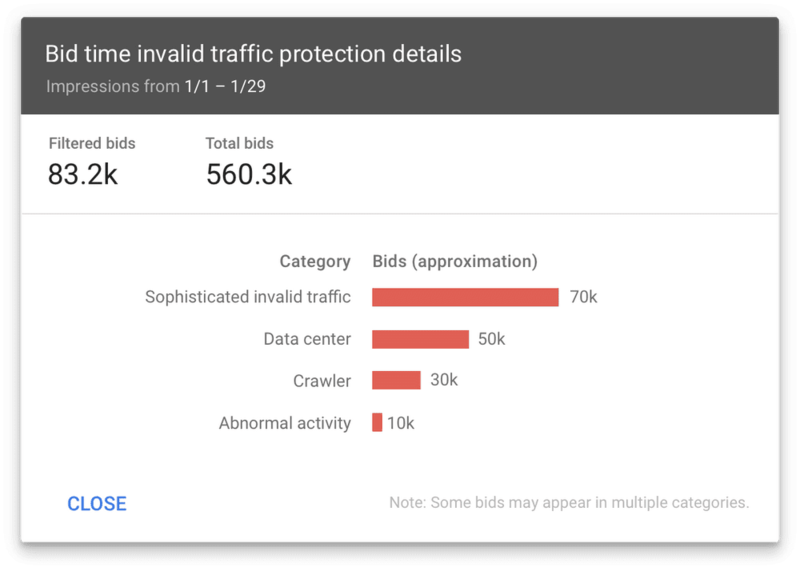 With these new features, advertisers will be able to see and understand the amount of invalid traffic detected in their campaigns both pre-bid and post-serve, including breakdowns by categories like data center traffic, automated browsers, and falsely represented inventory. Supply partners will receive reporting on the sources and amounts of invalid traffic that our systems are post-serve filtering from their platforms. By providing our customers and supply partners with access to this data we hope to provide more transparency into the sources of invalid traffic, facilitate conversations with third parties, and make sure our clients’ media spend does not enrich bad actors. Example of an upcoming change to our user interface showing the sources of invalid traffic. Beyond our own platforms, we are fully supportive of industry initiatives to improve the health of the advertising ecosystem and combat ad fraud. Recently, the IAB Tech Lab released the ads.txt standard to increase supply chain transparency and make it more difficult to sell counterfeit inventory. It defines a simple method for publishers to publicly declare who is authorized to sell or resell their digital advertising inventory. We believe the ads.txt standard is a significant step forward in the fight against ad fraud, and by the end of October, DoubleClick Bid Manager will only buy a publisher’s inventory from sources identified as authorized sellers in its ads.txt file when a file is available. The success of ads.txt will be defined by the extent of its adoption, and it’s great to see healthy adoption by publishers since the standard was finalized. These changes are just some of the things we’re doing to help combat ad fraud and increase transparency in the advertising supply chain, and it’s been great working with partners like Nissan Motor Corporation, Omnicom Media Group and GroupM as we developed these solutions. "We're extremely supportive of the steps Google is taking to bring transparency and accountability to the digital supply chain. It's critical that we have partners who are as dedicated as we are to protecting brands from ad fraud and we look forward to working together solve this issue for our clients." There’s no doubt that this is a complex problem, but if we continue to work together, we’re confident that we can address this challenge.